Applicants who are preparing for the Bank, Insurance sector examination to grab a Government job these type of online test is very beneficial to them. We will try to make 2-4 such type of Online Free test for our readers on weekly basis. These Free online test will contains the MCQs questions with number of Options. You have to choose one correct option. After completing the free online test your Exam Result comes in front of you on the top of the screen with your score and correct answers comes with respect to each question with full explanation. Don't miss out this GA Quiz. This section of General Awareness is one of the section that can help you bagging graceful marks in these examinations, that comprises of numerous sections like Banking Awareness, Static GK, and Current Affairs. Q1. Who among the subsequent has appointed as India’s chief boxing coach? Dronacharya awardee C A Kuttappa has appropriated as India’s chief boxing coach at the continuing national camp. He took over from veteran coach SR Singh at the start of the camp. Q2. The wildlife sanctuary of Kuno has been declared as a national park of India. In which of the following State it is located? Q3. Which one of the following Name has been conferred with the ‘Tansen Samman’ for 2018? MP Government Conferred Sitar player Manju Mehta with the ‘Tansen Samman’ for 2018. Q4. IWC (International Whaling Commission) is recently in news. Headquarters of IWC is located in which country? The International Whaling Commission has its Headquarter in the UK. It has a full-time Secretariat with headquarters located in the City of Cambridge, United Kingdom. Q5. The Union Government, Rajasthan and the World Bank signed a _______________________ million Development Policy Loan (DPL) to support Rajasthan in improving the performance of its Electricity Distribution Sector under the State’s ‘24x7 Power for All’ program. The Union Government of Rajasthan & the World Bank signed a USD 250 million Development Policy Loan (DPL) to support Rajasthan in improving the performance of its Electricity Distribution Sector under the State’s ‘24x7 Power for All’ program. Q6. The Central government of India and the _____________________ have signed 300 million dollar loan agreements for India Energy Efficiency Scale up Programme. The Govt. of India and the World Bank have signed 300 million dollar loan agreements for India Energy Efficiency Scale up Programme. They signed 220 million dollar Loan Agreement and an 80 million Guarantee Agreement for the Efficiency Scale-Up Program. NABARD has sanctioned an amount of Rs 335 crore under the Rural Infrastructure Development Fund (RIDF) to WB( West Bengal). The fund has been given in August Month, would be used for 158 minor irrigation projects and 23 flood protection projects. Q8. Which one of the following Name has created history by winning the Junior Debate Championship at the World Scholar’s Cup held at Yale University, the USA? Aadi Sai Vijaykaran created history by winning the Junior Debate Championship at the World Scholar’s Cup held at Yale University, the USA. The theme for the cup was ‘An Entangled World: diplomacy, human relationships, the science of memory, and literature, art’. Q9. Which of the following country formally announced that it would withdraw from the International Whaling Commission (IWC) and resume commercial whaling in its territorial waters? In a landmark policy shift, Japan formally announced that it would withdraw from the International Whaling Commission (IWC) and resume commercial whaling in its territorial waters next year for the first time in more than 30 years. Q10. PM of Bhutan is in New Delhi on a 3-day official visit to India. Name the Prime Minister of Bhutan. PM of Bhutan named as "Dr. Lotay Tshering" arrived in New Delhi on a three-day official visit to India. Thimphu is the capital city of Bhutan. Q11. The ‘Raja Mansingh Tomar Honour’ is given in the field of________. The ‘Raja Mansingh Tomar Honour’ was given to the Sankat Mochan Pratishthan in Varanasi for 2017 and the Natrang Pratishthan of New Delhi for 2018. The award is given to institutions for nurturing good music. Q12. A footballer named as "Luka Modric" which mainly plays as a midfielder in a football game. From which country he belongs from? Luka Modric is a Croatian professional footballer who plays as a midfielder for Spanish club Real Madrid and is the captain of the Croatia national team. This day of 4th Dec. every year is celebrated in honour of the maritime force’s role during the war with Pakistan in 1971 when Indian warships attacked Karachi port and successfully hurt Pakistani operations in the western coast. Q14. Which one of the following is the Current President of Asian Development Bank (ADB)? Takehiko Nakao is the current President of ABD. He is a Japanese civil servant who was elected the ninth president of the Asian Development Bank in 2013. Q15. The RBI (Reserve Bank of India) appointed former governor _________ as the chairman of the Economic Capital Framework (ECF) committee formed to address the issue of excess reserves with the central bank. The RBI appointed former governor Bimal Jalan as the chairman of the Economic Capital Framework (ECF) committee formed to address the issue of excess reserves with the central bank. Former RBI deputy governor Rakesh Mohan has been appointed the vice-chairman of the committee. Commonwealth Games (CWG) 2018 has been accomplished recently in Gold Coast, Australia with grand passion. This occasion has witnessed the vast number of participants from all over the commonwealth countries. CWG is one of the major sports event held after every 4 years at various location all over the World. That’s why; it becomes very significant and productive topic for all the competitive examinations. There are big probabilities that questions based on these following patterns may appear in your upcoming competitive examination. So our suggestion to all the participants to go through all these questions below, they may be very helpful to score max marks in your upcoming exam. Question No. 1. Wherein of the following place the 2018 Commonwealth Games were held recently in Queensland, Australia? 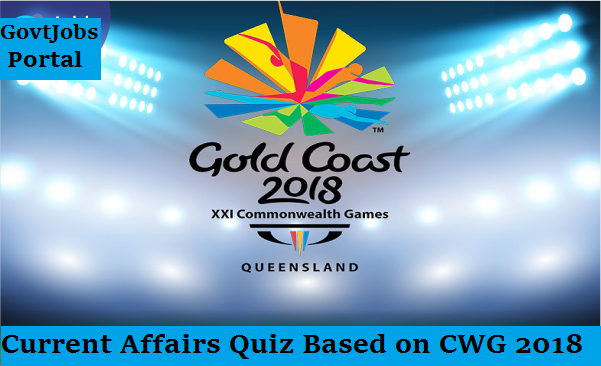 Detail: Commonwealth Games (CWG) 2018 (formally known as the XXI Commonwealth Games and commonly known as Gold Coast 2018) has been Started recently at Carrara Stadium in Gold Coast, Queensland, Australia. This is the fifth time Aus. has hosted the Commonwealth Games. This time we are going to share another practice test for the candidates who are preparing for Government Jobs /Bank jobs Examination 2018-19. All ready we share 2 test with you user and this one is the the 3rd one. Those who miss out our Previous Online Free Test can CLICK HERE to access that one Also. Stay with us for more online practice test. NOTE: AFTER CHECKING YOUR SCORE YOU WILL GET COMPLETE EXPLANATION OF EACH ANSWER. 1.In a certain code ROBUST is written as '593127' and BONE is written as '3964'. How is SORE written in that code? 2. How many such pairs of letters are there in the word SPORADIC (in both forward and back- ward direction) each of which has as many letters between them in the word as in the English alphabet? 3. 3. In a certain code TOWN is written as POSV and CARE is written as 'BFBQ'. How is BELT written in that code? 4. 4. The positions of how many digits in the number '9671285 will remain unchanged after the digits within the number are rearranged in ascending order from left to right? 7. The area of a square is twice the area of a rectangle. If the area of the square is 324 sq. cm. and the length of the rectangle is 13.5 cm. what is the difference between the breadth of the rectangle and the side of the square? 8. A truck covers a certain distance in 14 hours at the speed of 62 km./hr. What is the average speed of a car which travels a distance of 280 kms. more than the truck in the same time? 9. The average of four consecutive even numbers A, B, C and D respectively is 25. What is the product of A and C ? 10. Subodh got 72 marks in Hindi, 68 marks in Science, 62 marks in Sanskrit, 74 marks in Maths and 64 marks in English. The maxi-mum marks of each subject are 80. How much overall percentage of marks did Subodh get ? . 11. Amla's monthly income is four fifth of Meera's monthly income. Meera's annual income is Rs. 4,29,600. What is Amla's annual income? (In, 'some cases monthly income and in some cases annual income is used.) . 12. The sum of 45% of a number and 20% of the same number is 4056. What is 85% of that number? 13. 4 women alone can complete a piece of work in 16 days, whereas 8 children alone take 12 days to complete the same piece of work. How many days will 4 women and 6 children together take to complete the piece of work? . 14 . At present Satish is four times Madhur's age. After eight years Satish will be 2.5 times Madhur's age then. How many times will Satish's age be in an other eight years time with respect to Madhur's age then?. 15. Vaishali walks 180 metres every day. How many kilometres will she walk in 4 weeks? This time we are going to share a new Quiz with our readers. Continuing with our efforts this Quiz will contain questions related to the Current affairs 2ND week of January and some most important questions related to the computer. So do this test carefully and check your practice and as well as test your knowledge. 1. Russia has signed 2 agreements with Egypt to finance and build its initial atomic power plant at which Place ? 2. Which states will turn into the first states in India where "Walmart India" begins an entrepreneurial system for ladies in a joint effort with Society for Elimination of Rural Poverty? 3. Which states Government as of late marked 295 MoUs drawing in about Rs. 3.3 lakh crore ventures amid the Resurgent Partnership Summit 2015? 4. Who has as of late been chosen as the President of industry body Federation of Indian Chambers of Commerce and Industry (FICCI) for the year 2016? 5. An impact printer creates characters by using...?. 6. Which device you can NOT use with a flatbed plotter? . 7. Which one of the following is being used in an ink jet printer? . 8. Which of the following thing a laser printer does NOT utilize? . In this online Practice Test Series we are going to share some most important Questions from various Subjects including reasoning, Maths, Current affairs and other. Recently we share Free GK Quiz based on Current Affairs those who miss out those Online GK Quiz can CLICK HERE To access those. This is a free online Practice test for all candidates who are preparing for Government/Bank/insurance sector jobs. 1. Two vessels A and B contain spirit and water mixed in the ratio 5:2 and 7:6 respectively. Find the ratio in which these mixture be mixed to obtain a new mixture in vessel c containing spirit and water in the ratio 8:5? 2. In what ratio must wheat at Rs.3.20 per kg be mixed with wheat at Rs.2.90 per kg so that the mixture be worth Rs.3.08 per kg? 3. There are two sections A and B of a class, consisting of 36 and 44 students’ respectively. If the average weight of section A is 40kg and that of section B is 35kg, find the average weight of the whole class. Directions (4-6): Each of the questions below consists of a question and two statements numbered I and II given below it. You have to decide whether the data provided in the statements are sufficient to answer the question. Read both the statement and. Give answer (1) if the data in Statement I alone are sufficient to answer the question, while the data in Statement II alone are not sufficient to answer the question. Give answer (2) if the data in Statement II alone are sufficient to answer the question, while the data in Statement I alone are not sufficient to answer the question. Give answer (3) if the data in Statement I alone or in Statement II alone are sufficient to answer the question. Give answer (4) if the data in both the Statement I and II are not sufficient to answer the question. Give answer (5) if the data in both the Statements I and II together are necessary to answer the question. 4. What does 'Pa' mean in the code language? I. 'Pe Bo Pa' means 'Look at me' and 'Bo Se Pe Ki means 'don't look at him' in that code language. 5. How is Seema related to Mangesh? I. Shalini, the cousin of Mangesh, is the niece of Seema. II. Sulekha, Seema's sister, is the wife of Omkar, Mangesh's father. 6. What is Shekhar's rank in the class of 40? I. Samir, who is 9th from the top in the class is above shailendra by 12 ranks who is below shekhar by 5 ranks. II. Nilesh, who is between Shekhar and Sudhanshu, is 15th from the bottom. Directions (7-9): Which of the phrase (a), (b), (c), (d) given below each sentence should replace the phrase printed in bold type to make the sentence grammatically correct? If the sentence is correct mark (e) i.e. No correction required as the answer. 7. Long ago, there had no such thing as money and people exchanged the things that they wanted. 8. While playing cricket, I sprained my foot. 9. Mohanlal looking over himself into the mirror of the waiting room at the railway station. 13. A court of .....asked Facebook to stop tracking the country's Internet users who are not members of the US-based social networking website. 14. Which Country Government blocked social media platform on security grounds? 15. Which Country Signed Right to Die Bill for terminally ill people into a Law? We are going to share the Free Current Affair Quiz-2. Last month in Dec. we share the online GK Quiz based on Dec. Current Affairs. Now on 11th Jan. we are going to share GK Quiz-2 Based on Jan. first weak News 2016. These online GK Quizzes are very important for all upcoming Government Jobs examination. Next we are going to share the new one. So stay with us for more online Free GK Quiz for Practice. Those who miss out our Previous Online Free GK Quiz can CLICK HERE to access that one Also. 1. The World Bank & Union government have signed an agreement for how much amount for this project which is named as Nai Manzil Scheme. This project is to helping out young people from minority communities to complete their education & to improve their employment opportunities? The Union government and the World Bank signed a $50-million credit agreement for a project aimed at helping young people from minority communities complete their education and improve their employment opportunities named Nai Manzil Scheme. 2. The ambitious “odd-even Car” scheme recently started in which states to combat spiralling air pollution? The ambitious odd-even scheme of Delhi government, a first such intervention in the country to combat spiralling air pollution, got off to a decent start on new year with volume of cars on the city roads coming down significantly amid deployment of thousands of policemen and moderately augmented public transport. As the clock struck eight, the vehicular restriction policy came into effect with thousands of volunteers carrying roses also taking to the streets to assist traffic police in enforcing the pilot plan that will stay in force till January 15. 3. Long Range Surface-to-Air Missile (LRSAM) or BARAK 8, was successfully test-fired on the Western Sea Board. The missile was co-developed by India in collaboration with which country’s Aerospace Industries? Long Range Surface-to-Air Missile (LRSAM) or BARAK 8, the missile co-developed by India and Israel, was successfully test-fired on the Western Sea Board. The missile was fired from INS Kolkata and it successfully intercepted an aerial target at extended ranges. The test-fire was jointly carried out by the Indian Navy, Defence Research and Development Organisation (DRDO) and Israel Aerospace Industries. 4. Iran’s leading banks Pasargan Bank and Parsian Bank of Iran will open branches in India to energise commercial ties between India and Tehran. Above banks of Iran to set up branches in India at which places. Iran’s leading banks will open branches in India to energise commercial ties between New Delhi and Tehran. The decision was amongst a slew of commercial measures taken by the India-Iran Joint Commission that met for the first time. After the meeting led by External Affairs Minister Sushma Swaraj and Iranian Finance Minister Ali Tayebnia, India decided to allow the Pasargan Bank and Parsian Bank of Iran to set up branches in New Delhi and Mumbai. 5. Recently one of the Pakistani singer gets Indian Citizenship? Select the Correct one ? The Union Home Ministry cleared the proposal to grant Adnan Sami the citizenship of India. Mr Sami, who has been staying in India since 2011, will now have to fill a citizenship form at the Home Ministry’s office in Delhi and pay Rs 13,700. He will be given citizenship under Section 6 (I) of the Indian Citizenship Act, 1955 under the category “citizenship by naturalisation.” Lahore-born Sami first arrived in India on March 13, 2001 on a visitor’s visa with a validity of one year. 6. India’s central bank has asked the lenders to open more brick and mortar branches in villages with no banking facilities and with a population of more than __________? India’s central bank has asked the lenders to open more brick and mortar branches in villages with no banking facilities and with a population of more than 5,000. The banking regulator has asked banks to submit a roadmap on how many branches they will be opening by 31 March 2017. 7. Who has recently been appointed as the new CMD of defence PSU BEML Ltd? The Public Enterprises Selection Board has recommended D.K.Hota to be the new CMD of defence PSU BEML Ltd. He is currently Director (HR) of the Bengaluru-based BEML. He has been on deputation at BEML from oil marketing major HPCL for the past two years. 8. Which one of the following cricketer get the BCCI’s cricketer of the year award 2015 ? Indian Test captain Virat Kohli was named ‘Cricketer of the Year’, while Mithali Raj was picked for the M.A. Chidambaram Trophy for the best women’s cricketer. 9. The Col. C.K. Nayudu Lifetime Achievement Award 2015 given to _____? Ans. Syed Kirmani Former wicket-keeper batsman Syed Kirmani was today nominated for this year’s Col. C.K.Nayudu Lifetime Achievement Award. The Award comprises a trophy, citation and cheque for Rs.25 lakhs. Kirmani, who made his Test debut in 1976 against New Zealand, kept wickets against India’s famous spin quartet. 10. Who has recently won the Qatar Masters Open chess tournament, billed as the strongest Open in history?. Ans. Magnus Carlsen World champion Magnus Carlsen of Norway won the Qatar Masters Open chess tournament, billed as the strongest Open in history. The top seed had finished with seven points, the same as Yu Yangyi of China, seeded 11th. He drew his 10th and final round encounter with former World champion Vladimir Kramnik of Russia, while Yu defeated Wesley So of the United States. 11. eASIA Award under Trade Facilitation category Given to which of the following?. Ans. The Drug Authentication and Verification Application The Drug Authentication and Verification Application (DAVA) project of The Department of Commerce has won the 2015 eASIA Award under Trade Facilitation category. The award was announced by Asia Pacific Council for Trade Facilitation (APCTF) and Tehran based (Iran) Electronic Business. The eASIA award is administered by AFACT which aims to development and promotion of trade facilitation, electronic business policies and activities in the Asia Pacific region. 12. One of the following person is recently conferred with prestigious 2015 Sangita Kalanidhi award? Select the correct one ? Ans. Sanjay Subrahmanyam Foremost south Indian classical vocalists Sanjay Subrahmanyam has conferred with prestigious 2015 Sangita Kalanidhi award. The prestigious award was bestowed upon him by renowned mathematician Manjul Bhargava at 89th annual conference of the Madras Music Academy in Chennai, Tamil Nadu. 13. The Union Government has constituted a committee to examine the wage structure, service conditions of the Gramin Dak Sevaks (GDS) in the Department of Posts (DoP). This Committee is headed by?. Ans. Kamlesh Chandra The Union Government has constituted a committee to examine the wage structure, service conditions of the Gramin Dak Sevaks (GDS) in the Department of Posts (DoP). It is one member committee comprising of Kamlesh Chandra, Retired Member of Postal Services Board. 14. A cancer research expert from Indian-origin was recently honoured with a Knighthood from Queen Elizabeth II because of his quality work on prevention and treatment of cancer?. Ans.Harpal Singh Kumar An Indian-origin cancer research expert Harpal Singh Kumar was honoured with a Knighthood from Queen Elizabeth II for his influential work on prevention and treatment of cancer. Mr. Singh’s name has appeared in the 2015 New Year’s Honours list that includes several other Indian-origin individuals. 15. One of the following is the first Indian state to start accept e-motor insurance policies? Which one is that ? Ans. Telangana Electronic motor insurance policies are legally accepted by the police and transport authorities in Telangana from today, making it the first state in the country to do so. The e-Vahan Bima, an electronic motor insurance policy issued in digital form with Quick Response (QR) code, has been formally launched here by the Minister for IT, K T Ramarao.